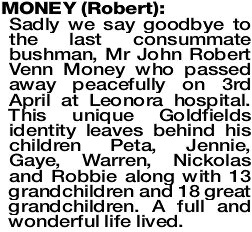 MONEY ROBERT Sadly we say goodbye to the last consummate bushman, Mr John Robert Venn Money who passed away peacefully on 3rd April at Leonora hospital. 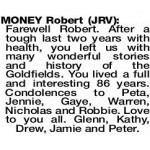 This unique Goldfields identity leaves behind his children Peta, Jennie, Gaye, Warren, Nickolas and Robbie along with 13 grandchildren and 18 great grandchildren. A full and wonderful life lived. Former husband of Carol. Father of Peta, Jennie, Gaye, Johnny (dec), Warren, Nickolas and Robbie. Life was a rollercoaster, never dull. Throughout we had wonderful times. Thank you. Especially thank you for our beautiful boys. Your pain is over now Rob. Sleep peacefully. Farewell Robert. After a tough last two years with health, you left us with many wonderful stories and history of the Goldfields. You lived a full and interesting 86 years. 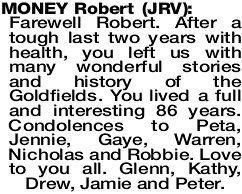 Condolences to Peta, Jennie, Gaye, Warren, Nicholas and Robbie. Love to you all. Glenn, Kathy, Drew, Jamie and Peter. 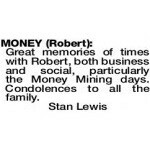 Great memories of times with Robert, both business and social, particularly the Money Mining days. Condolences to all the family. So long Robert. 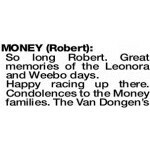 Great memories of the Leonora and Weebo days. 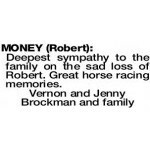 Deepest sympathy to the family on the sad loss of Robert. Great horse racing memories.